I thought I’d start out by showing you Harry, the ‘Cubs Win! 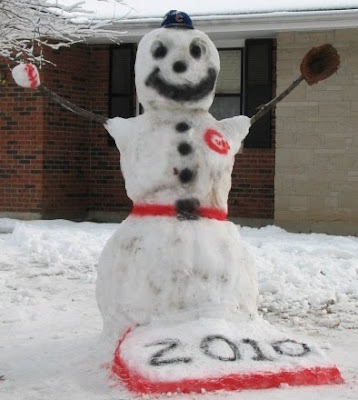 !’ Snowman, from down the street. Yes, Harry, is dreaming of Springtime but I’m thinking it will be another ‘cold day’ and not in October before his 2010 dreams come true!! For us, this spring will be our longest extended trip in our motorhome to-date. Our plan is to be on the road for approximately seven weeks this time. For me, half of my enjoyment of RV travelling is planning and researching, mostly online, the options we have for routes and adventures. In my past life, as a project director, I had a particular knack for detailed planning so I guess this is just a natural extension of 30 years experience in that area! I have found our virtual RV family to be extremely helpful when rookies like Ken and me have questions and are looking for ideas. And so, I’d like to pass on what we’ve learned so far to those even newer at this experience than we are. The techniques for RV Adventure Planning that I note here have proven successful for us so far. As you’ll see from our notes below, a lot has to do with the kind of adventures that are of most interest to you. For example, while we look first of Corp of Engineer parks you might be more interested in private parks. While we like to search out wildlife and obscure attractions, you might have a different hobby or interest, such as wine-tasting or architecture that requires adding some different searches in to your planning. I’d love to hear from the ‘old pros’ on other ways they’ve found to perfect their adventure planning. 1. Googlemaps.com – I find this the easiest and most flexible online map tool. I put in my known destination(s) and then start breaking the trip down in to approximately 200 mile segments. It’s really nice not to have to be in a hurry, so we are trying to go with the RVers Rule of 2’s driving no more than 2 hundred miles a day, arriving at our new site by 2 pm and staying for at least 2 days. 2. 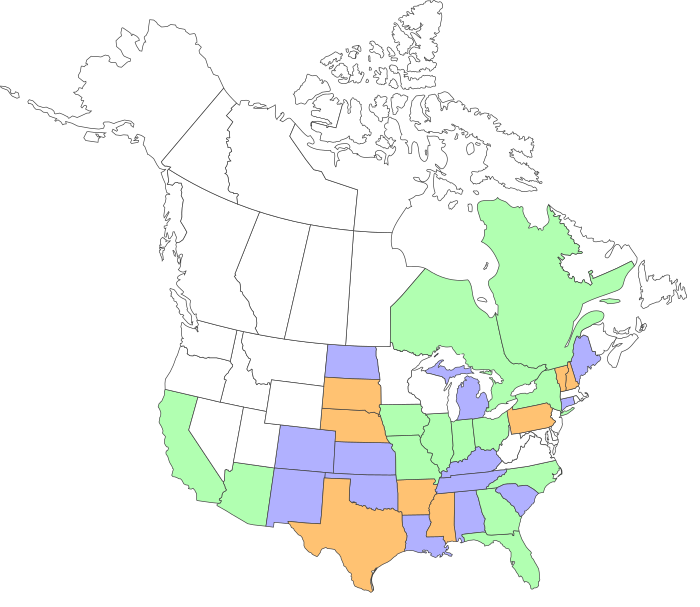 Reserveamerica.com – because Ken has a Golden Access Pass, it is our preference whenever possible to find Corp of Engineer parks where we can get nice sites, usually for ½ price. This website provides the additional critical info about the sites such as the site lengths, and the site grade which is very important in a motorhome with a hubby that is very touchy about being level. Based on whether we are staying over a weekend or what the availability looks like online we might go ahead and reserve a spot. Of course, I prefer not to if possible to leave our options open. For this spring’s trip we are not making many reservations, except for over holiday weekends, since we will be travelling before schools are out and most parks appear to still have lots of availability. 3. RVParkReviews.com – we use and contribute to this site regularly and have found it to be the most reliable online source for opinions on various campgrounds. Because you have to enter at least 3 different campground reviews before this site will publish any of your reviews, most reviews are legite and not from owners and employees trying to market their location. 4. PassportAmerica.com – there is an annual $44 membership fee but for us this has been worth it based on the number of items we’ve used this. If we can’t find Corp of Engineer parks in an area, we will next look for a Passport America member park where we can receive a ½ price site. We’ve found it is important to compare these parks to the RVParkReviews since Passport America does not always seem to set a high standard for member parks. It’s also important to carefully check the rules of when they offer ½ price – usually not on weekends and seldom for more than a couple of nights at a time. 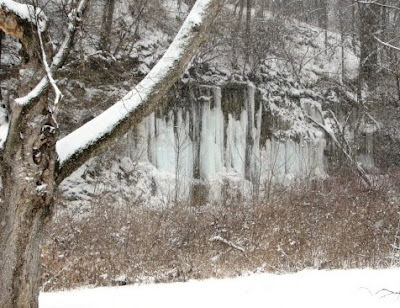 Since we currently aren’t carrying our own internet access, I like to look for private PA parks with wifi to intersperse between our state and federal park stays where there is seldom wifi. 5. Campground Directories: Woodall’s, Trailer Life, Escapee’s - we use both of these directories but have found that, in Woodall’s and Trailer Life their ratings take in to account a lot of things we don’t really care about like children’s activities and recreation facilities onsite so while we might find a campground using one of these directories, we usually go back to RVParkReviews to check recommendations. This next trip will be our first experience staying at an Escapee’s Park in Alabama and we are really looking forward to that. We also belong to Good Sam’s but have really not found their online campground directory very useful compared to others and have found their trip routing tools generic. The one thing that is kind of slick with Good Sam’s routing is that you can put in your route and see where gas will be the cheapest along the way, this can say you a few bucks when filling up 100 gallon tanks! 6. RV-Dreams, RV.Net and Escapees forums – the folks contributing to these forums are usually very helpful when I have questions. 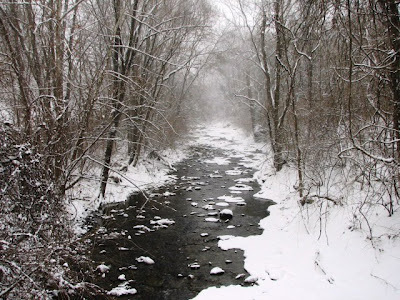 For example, I received website links from folks that helped us better understand our I-40 detour options and also helped us decide where to make our stops to make the most of our limited time in the Smokey Mountains. I try to use these forums after I’ve done my best to get the information figured out myself as best as I can. That way I’m not badgering people for info that is easily gleaned from online searches myself….don’t want to wear out your welcome you know. Again, I think it is important to do your part on the forums that you use and try to not only ask but answer when possible. 7. 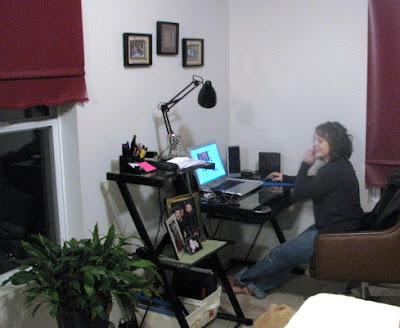 Blogs and trip journals of other RVers – on the left sidebar of this website you’ll see the blogs that we follow regularly. Most of these folks also have RV blogs that they follow regularly that aren’t on our list, but I follow many of them as well! By drilling through these, I can often find interesting information on areas that they have visited that offer ideas on where to eat, what to see, etc., often with pictures and ideas that are more specific to RV travel. For example, it is through these folks that we’ve make our decision to include Betty’s RV Park in Louisiana in our itinerary. 8. The Next Exit – while we don’t normally use this in our preliminary planning, we’ve found that once we are actually moving this book is our primary resource for planning stops for gas, groceries and dining. Let’s face it, when in a 40 foot motorhome you don’t want to be making last minute decisions on which exit to take, which lane you need to be in at the top of the ramp, and whether or not the fuel station or restaurant is capable of handling a big rig. The notes in this book take the guesswork out of making pitstops. I’ve heard some RVers go as far as to say this is the most important directory they have in their RV. I only wish it covered US highways as well as Interstates, but even as it is I would hate to leave without it. 9. Tripadvisor.com – When we are headed in to an area, I will use Tripadvisor as one source to find the best rated attractions and restaurants in the area. For example, when we found ourselves in Grand Rapids, MI, for a few days, this site pointed us to both the Frederik Meijer Sculpture Park and the Heritage Hill Historic District where there are some great Frank Lloyd Wright houses. When we finished those explorations, we used the sites restaurant advice to find a wonderful little café, Marie Catrib’s. (see Aug 27, 2008 blog). This meant that we went to the #1 rated attraction and the #1 rated restaurant in Grand Rapids and left with a great impression of the community. Unfortunately, there are a lot of smaller towns without reviews since coverage is only as good as what individuals freely contribute so, again, I am trying to discipline myself to also write reviews here as well as search them. 10. Roadsideamerica.com – guide to unique, offbeat tourist attractions; ok, maybe this doesn’t float your personal boat, but Ken and I love to find the obscure. You’ll notice that from past blogs where we’ve included photos of the goat tower, the two-story outhouse, and of course, the best hamburger in America at Moonshine. 11. 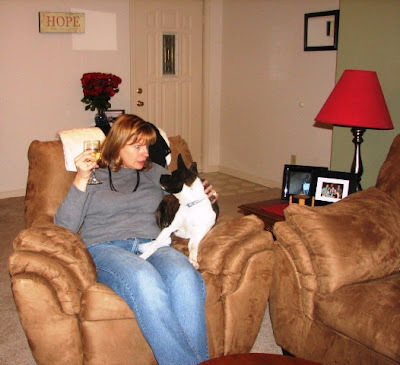 Facebook – I have developed a growing number of RV contacts on Facebook and we continue to get ideas every day from what these folks post about places we’d like to visit and ideas on how to make the most of our RV travel. Some folks who don’t blog regularly, do put out great photos and comments on their travels on facebook. 12. Day’s End Directory – this is an Escapee’s 400 page downloadable document containing hundreds of boondocking and low-cost parking opportunities, submitted by traveling members and collected and organized by an Escapee’s member who updates regularly. This list is available to Escapee’s members for $5 with updates available through a Yahoo group. Ken finds it difficult to sleep in truck stops, Walmarts and such (I think he is in an extra protective ‘on guard’ mode and wakes at the slightest sound). So, we haven’t used this much but it’s good to have as a backup if other overnight plans get blown out of the water. We are going to have to start working these low/no cost alternatives in to our budget so we will look for opportunities to work one or two such nights in to this next extended outing. 13. General Google searches – of course, very often I have to do additional searches based on information I find using the resources above. For example, there is supposed to be a wonderful walking tour of historic Charleston but I don’t know the times or costs so I have to start googling. Now I know the tour is not available on Monday or Tuesday so we can take that in to consideration in our planning. The downside to this way of planning is that almost everything is online. For this reason, I try to download pertinent information to my laptop assuming that I won’t have internet access when I need it. I hate printed paper because of the room it takes, the clutter it creates and the trees it kills. Of course that means more likely than not I’ll miss downloading a page that ends up being critical like when we decide we want to do a restaurant but haven’t downloaded the phone number or hours of operation. We still have 18 months on our AT&T contract so I’m holding out until May hoping that rumors are true and ATT will start selling the Palm Pre so I can carry my wireless hotspot on my phone versus buying a separate air card. Until then we are stuck on this trip with searching out wifi internet access. Because my Kindle has some basic internet access I can use it to, at a minimum, find some sites in an area that offer wifi. We have found our two most consistent ways to get internet in the small towns to be local libraries which almost always have free wifi, or McDonald’s where you can get online for $3 for 2 hours. Most GPS systems will get you to the nearest library or McDonald’s. If not, I haven’t encountered a state or federal campground yet where the hosts couldn’t tell me the closest spot to get access. Because I end up with a lot of data for lengthy trips, I set up a summary spreadsheet with one row for each leg of the trip and then include links to the related documents on my laptop from that spreadsheet. This gives me a sort of drilldown capability to retrieve information as we need it. We do have a laptop based GPS system that we use for the actual turn-by-turn routing, but plugging in the next destination is a pretty simple matter once we have the larger itinerary organized. I’ve just about completed our 7 week plan and will publish soon hoping that there might be inputs from some of the ‘pros’ that can help us with refinements. I've been asked for an update on our home remodeling. As you may remember, just before my decision to take early retirement last July, Ken and I had purchased the materials to update our second floor, including ceramic tiles, hardwood flooring, new bathroom cabinets and granite countertops. The idea had been to hire the work done since Ken's health no longer allowed him to work full time at remodeling. Ok, Ken is now doing the work himself as his health allows. It's going really slow but there is some progress that I can show off. 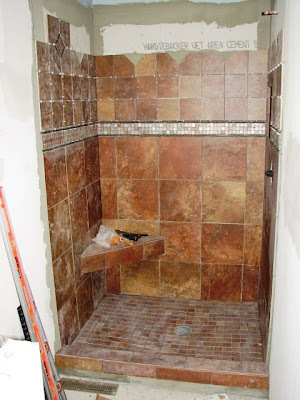 My talented better-half has spent a lot of time in one corner of our house, namely the master bath, and has made considerable progress in the shower area. 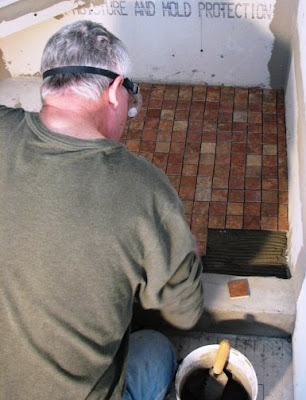 Although Ken has quite a bit of experience doing tile, he's never before done a tiled shower base. This meant a lot of networking and study for him to be sure he was getting everything just right insuring no problems with leaks or cracks. He tore out our 20 year old figerglass shower surround with sliding doors, stripped out the old drywall and then extended the shower size a bit. 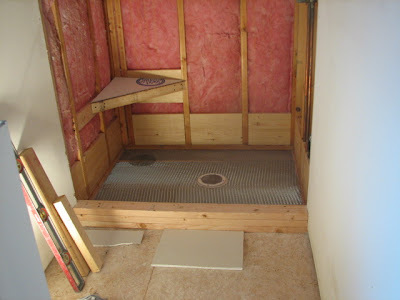 He added a seat and a shelf cove next to the shower head for holding shampoos, etc., He moved the drain from the front to the center and created a curb to hold in the water. 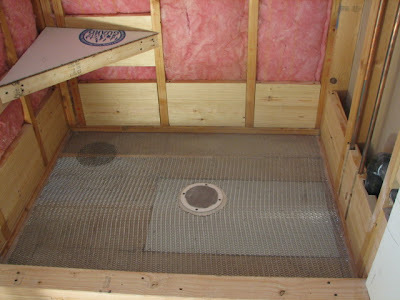 He then added the 2x8 blocking for the liner and stapled in the metal lathe. 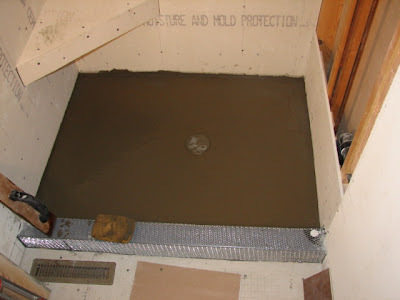 The first pour was of waterproof concrete to shape the shower pan. 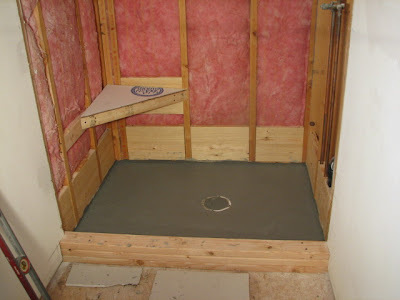 He relined the shower walls with Hardibacker cement board. It was then time for a second pour of the base with a sand mix to bring it up to drain level and to finish shaping the pan and curb. Then the fun part started, actually cutting and laying in the small tiles to make up the base. It's now beginning to look like a shower. Although things have slowed down a bit for the artistic work Ken is doing to add some designs. Once the tile is all laid in properly it will be time for grout. I'm really anxious to see it once we are able to clean it up, removing the cement film and dust with the grout all in place. 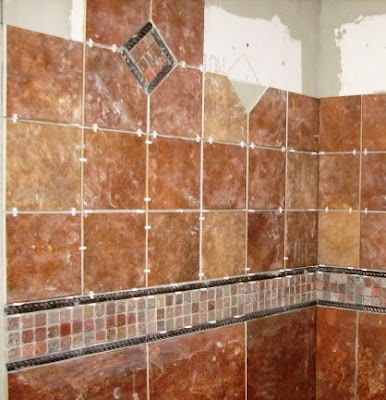 We are still 'negotiating' the shower door since I want all glass and no metal and we are finding this usually means something from a custom glass shop that specializes in this work. 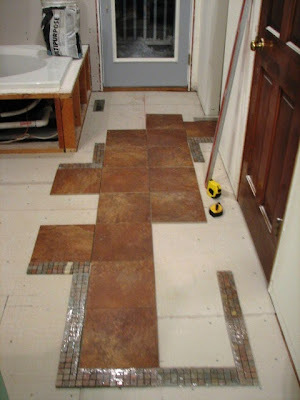 The next phase will be to continue the tile out in to the main master bath area where Ken has already started laying out the design. I guess we'll always be able to remember form these pictures that Ken was doing the work during winter since you can see the snow on the 2nd floor deck outside! Ken loves doing this kind of work and its really too bad his health has gotten to the point where he is limited to the number of hours he can put in. But, that's what makes it nice about working on your own house. Sometimes he doesn't feel up to working at it all day and sometimes he'll start in at it after supper and work late in to the night. My job description in this project would read as follows: beast-of-burden for carrying items up and down from the second floor; garbageman to gather and dispose of scrap materials; janitor to attempt (and partially fail) to keep the huge amount of dust contained and in the shop vac versus in the rest of my house; delivery boy running to Lowe's, Home Depot, etc., ; accountant (we do now have to stay within a budget for remaining costs - not something we paid a lot of attention to when I worked); coffee and lunchtime caterer; medic (thank goodness not much more than split finger at this point)...and other tasks as assigned by Ken, the project leader! I have on rare occassion been elevated to mud dobber, tile corner sander and even tile cutter although I am hesitant to get too much between an artist and his work!! I'm very lucky to have such a remodeling wiz kid!! 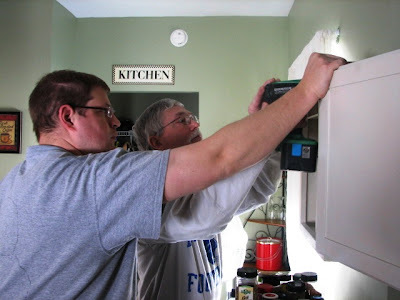 While Ken is working on remodeling the upstairs I continue to work on 'remodeling' myself along with challenging son, Kyle, to so the same by sticking to the Weight Watchers program. As of the 6th complete week on program, Kyle has lost 25 lbs and I have lost 12. We are both working hard to make this is a permanent lifestyle change, not just a diet. One thing that means is renovating some of our traditional eating practices. Ken and I have always believed in starting the day with a good breakfast but it is also easy for that to get out of hand in terms of points when you add fatty meats such as sausages, multiple eggs, potatoes and toast. I didn't want to deprive Ken or not be able to still sit down together to start our day with breakfast so I worked out a compromise. What I have found is that I can still eat with Ken, while he has his 'big breakfast'. I have simply changed over my meal to be primarily high protein for energy and fiber for feeling full with less. 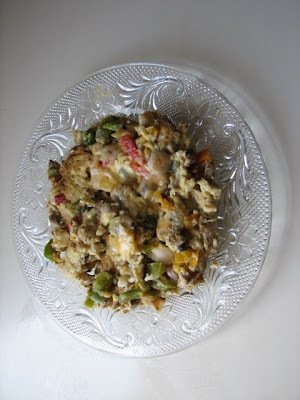 The trick for me has been to change our eggs over to a special egg scramble I make. One serving is only 2 points and is really big. I take one whole egg (that's where the 2 points come from) and one egg white and scramble well along with a splash of water. Eliminating the other egg yolk not only halved the points but also is a good step for watching our cholesterol. Sox is especially fond of this renovation of reducing the egg yolk since she now gets the yolks as a special morning treat. 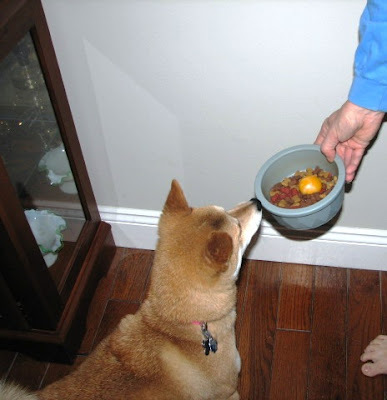 (Do take in to account the pros/cons of raw egg for your furkids before doing this. Click here for related article). She apparently can hear me crack that first egg from anywhere in the house and is immediately at my feet reminding me that she's ready for her share. And, if you are wondering why I'm giving only Sox this added treat, its because Ditka is allergic to poultry items. He doesn't get left out though because when I put Sox in one room to enjoy her egg yolk, Ditka positions himself by the refrigerator to remind me that he expects a treat as well which usually comes in the form of a small piece of cheese -- just to insure fair treatment across Frericks puppydom. If I walk past him and go back to finishing the eggs, he'll usually be patient for about a minute before he starts to whine. Amazing how quickly they pick up on a routine!! 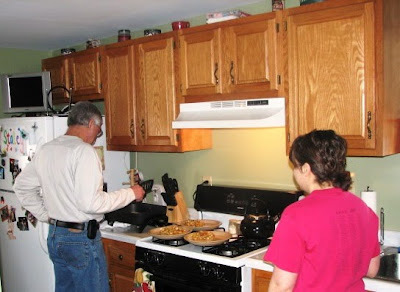 I spray our electric skillet with butter spray and sautee mushrooms along with an ample supply of onions and peppers. This doesn't need to be time-consuming since Birds-Eye makes a Pepper Stir Fry that you can use straight out of the freezer. I also chop my mushrooms in advance and put them in the freezer to use for this purpose as well. (Such frozen mushrooms are only good for cooking, not for use on fresh items such as salad). Using plenty of these veggies provides a lot of volume and flavor without any added points. Once the onions are translucent and the mushrooms browned I pour the egg mixture over. I like to add some Mrs Dash and a little salt of pepper. When the eggs are nearly done I put a little sprinkle of 2% grated cheese on top and let it melt. The portions I've mentioned above are for one serving. I usually have to double for Ken and I both. Ken likes to add a dollop of salsa. The eggs from beginning to end can be completed in about 5 minutes so its not taking lots of time in the kitchen. This along with a whole orange makes a very filling 3 point breakfast for me. It's amazing how much more filling a whole orange is for 1 point than my prior 8 oz class of OJ at 2 points. My skinny husband still likes to add his meat, potatoes and toast but I find we can sit down together with this combination and both be quite happy with this breakfast together while I stay comfortably 'on program'. Everybody in the house is pleased with this breakfast renovation, even the dogs!! 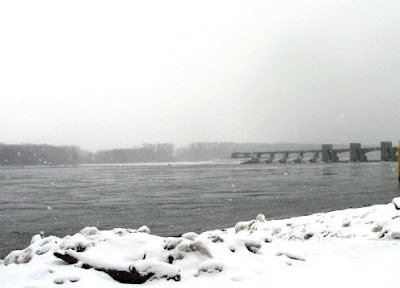 Reporting to you from the banks of the Mississippi on this snowy Valentine's Day, 2010. 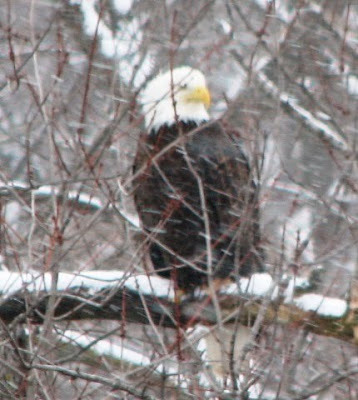 Ken and I decided it was a play-day and so decided to head out in the snow in the jeep, maybe see if any of the eagles were out down by the lock and dam. 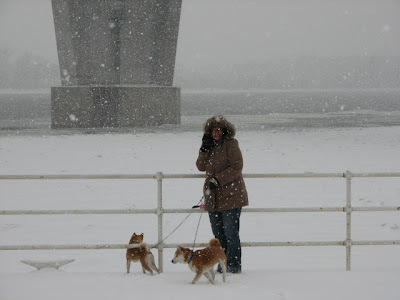 Ditka and Sox were all about a walk by the river even in the blustery snowstorm. We had so much fun playing and driving about in the snow that we stayed out for several hours. 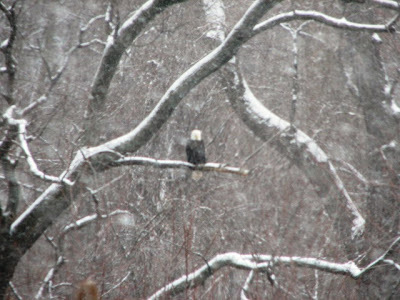 I'll leave you with some of the other snow pictures we snapped during our snowy Valentine's adventure. Hope you all had as much fun with your Valentine today as I did!! 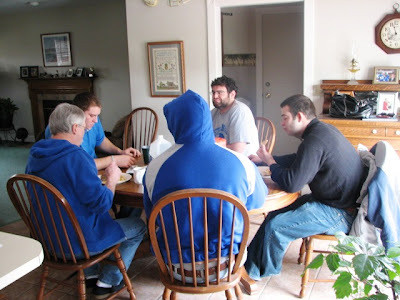 While Ken and I were visiting Kyle in Carlinville, Trevor and his EIU housemates visited Quincy. I left plenty of food for them to warm up as needed while we were gone and they -almost- had an uneventful Friday evening. Apparently sometime during the evening there was some shenanigans that resulted in a hole in our rec room drywall. Trevor knew that it was not a great idea to let Dad come home to a hole in the wall so he went in to the upstairs area where Ken is remodeling and found the materials to patch the wall. 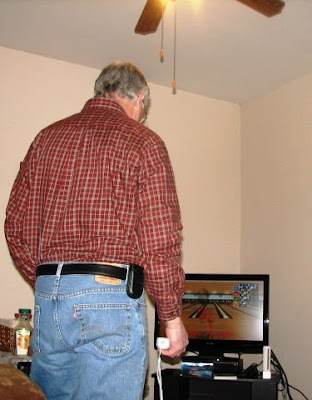 When we got home, rather than go ballistic about the wall, Ken was actually complementary to Trev on his drywall job. He was even pleased to see that Trevor had done a good job of cleaning up the tools after. Unfortunately, things went down hill fast after that. Apparently Trevor cleaned the tools in the bathroom sink which now was totally clogged!! 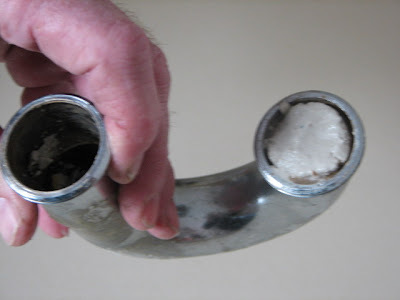 Here's what drywall putty looks like when it gets in the P-trap of the sink!! It was really packed in there tight!! Luckily the P-trap stopped the putty and once Ken cleaned it out all was once again right with the world. Saturday night was the annual Liesen Euchre Tournament and the reason the boys had driven over from Charleston. Ken went as Trevor's partner which meant that I became the designated driver for the evening. They called me for a ride shortly after midnight. Apparently their were 23 teams this year. Chris and Kevin had placed second in the tournament. Ken and Trevor did ok but not good enough to be 'in the money'. While Ken was ready to go home and put on his jammies, the boys were primed to keep the night going and so I dropped them off at the Phoenix, one of the clubs in Quincy with a late-hours license. Ken hadn't drank much so he took over the designated driver duties at that point and ended up picking the guys up in two shifts, one about 1:30am and then the rest at about 4:30am. Since Quincy has no taxi service after midnight, if you don't want partying family and friends out drinking and driving this is about the only option. Ken doesn't mind since its only once in a great while and they do seem to have a great time in Quincy. 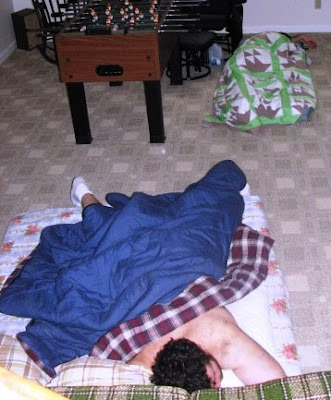 When I got up in the morning, there were bodies covered by my assortment of Grandma quilts strung out about the rec room. I knew the guys were hosting a Superbowl party backing in Charleston so I left the dogs down to start digging them out at about 10:30. Sounds like they all had a great time but weren't exactly thrilled about facing the day after. Things were pretty quiet around the breakfast table! We got them on their way about 11:30 and then Ken and I settled in for a quiet afternoon. We treated ourselves to a shrimp cocktail appetizer during the SuperBowl along with some chili. It hadn't been a great weekend for sleeping so we were both ready to hit the sack as soon as the game was over. PS. For the person who asked in the blog comments how Weight Watchers was going. Kyle has now lost 20.6 lbs since the New Year started. In my five weeks on the program, I've now lost 11.4 lbs. We are both well on our way to meeting our targets by the November wedding! ...and...thanks for asking!! 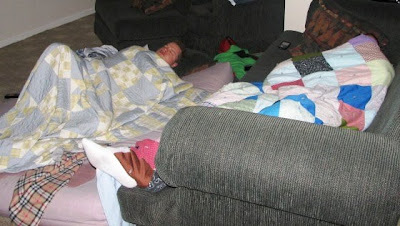 Kyle's House with the "Jenni Touch"! Friday, Ken and I braved the ominous weather predictions, and travelled to Springfield, IL, for our appointment with Green Motors to have a recall taken care of on the Audi. The timing of the work being completed was perfect for us to do lunch at Olive Garden. This time I was prepared and knew how many weight watchers points to expect. Ken and I did the unlimited soup, salad and breadsticks but I had the waitress bring the salad dressing on the side. They do offer a fat free version of their signature dressing that I ordered, while Ken had the regular dressing. I couldn't tell the difference in taste but it sure does make a big difference in points. 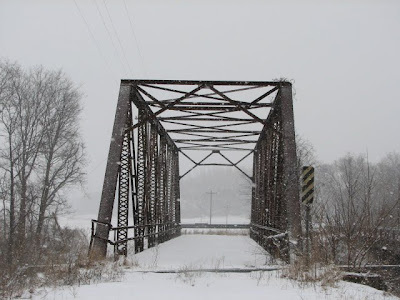 We then got back on the road to make an overnight visit to Kyle's house in Carlinville. We planned the Audi appointment and the visit so that we could see Kyle's Freshman team, Piasa High School, play their last game. 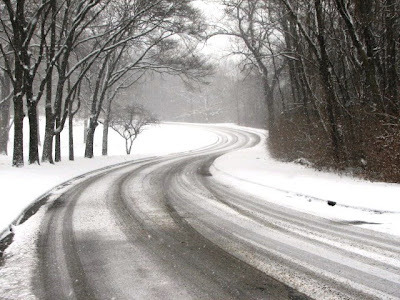 Unfortunately, we were nearly to Carlinville when Kyle called to say that all games for the weekend were cancelled due to the snowstorm. The snow was starting to come down heavier and so our timing of getting to their house by mid-day worked out just about right. The house really looks different now that Jenni has added her decorating touches. 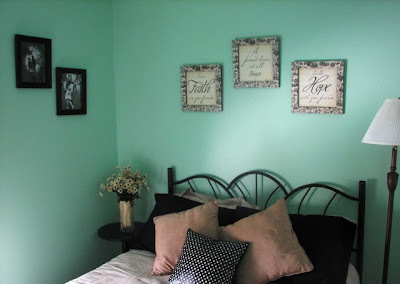 Since the last time we were there, they painted the guest bedroom that had been empty and set it up nicely for guests. My intent was to have Ken cook salmon for Kyle and Jenni for dinner but when we got to the store they didn't have any fillets we liked. Since we were both tired, and Kyle and I both had plenty of Weightwatchers points saved up for the week, we decided it was just all falling in to place to go out to eat instead. This allowed Ken and I an hour or so to nap/watch TV with Staley before the kids got home from work. After dinner we went back to the house and just chilled out there, having a few drinks, and playing Wii. Saturday morning, since we didn't have a basketball game to go to, Ken cooked breakfast. 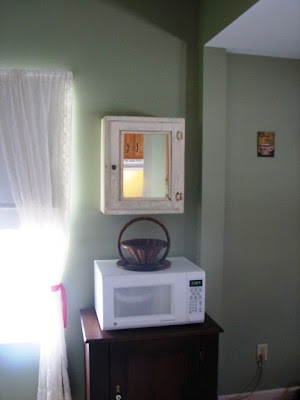 After that Ken and Kyle did a 'honey do', putting up a neat antique medicine cabinet that Jenny had found at a second-hand store. It will make a great little spice cabinet in the kitchen. 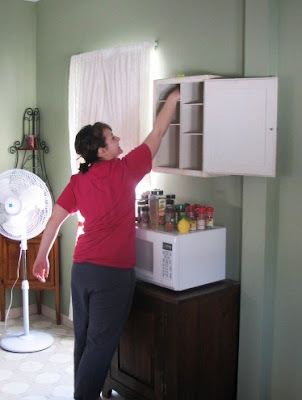 Testing the height of the spice cabinet, yes it is acceptable "Jenni-height"
Since Ken hadn't slept well the night before (he really has trouble sleeping on a flat bed), we left just before noon so that we could get home and get a nap. That's all for now. I'll cover the EIU boy's visit in the next post. 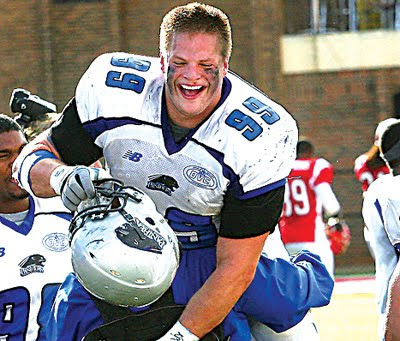 We just learned today that Trevor Frericks was named Defensive MVP at Eastern Illinois University for the 2009 season! Beside the tackles, sacks, and fumble recoveries he also recorded an interception, blocked a kick, and recorded a safety. Trevor played 12 games in 2007, 6 games in 2008 (torn mcl), and 12 games 2009. At Bowling Green (MAC Conference) Red shirted 2005, and played in 4 games 2006. While at Eastern, Trevor played in the playoffs in 2007 and 2009 losing in the first round both years. More important than the stats and games are the relationships he developed with his team mates and coaches. These guys practiced hard, played hard, partied hard, spending alot of time with each other. They know each other. They know that they can count on each other and they know their team mates will be looking out them. They are friends and team mates for life! Post script: Several of Trev's team mates have also become very close to us and will aways be considered part of the family.